Imagine it: glittering sunshine on an aquamarine sea, a refreshing breeze on a hot summer’s day, an invigorating dip in crystal clear waters. There is, quite simply, nothing quite like a coastal retreat to bring a sense of tranquility and rejuvenation. At Heritage, we believe that it’s possible to bring that sense of ocean-inspired calm into your home. Fresh, invigorating and defined by clean lines, the Mediterranean aesthetic is the perfect look for a sea-themed bathroom. Whether you’re looking for summer bathroom ideas or simply love design inspired by a seemingly endless stretch of sparkling ocean, we’re here to help you create a bathroom reminiscent of tranquil days under the hot summer sun. For many, the starting point for any new bathroom design is choosing a colour palette. If you’d love to create a coastal bathroom inspired by the sea, the right hues are absolutely key in creating a tranquil space. Shades of blue, teal and aquamarine mirror the ever-changing colours of the ocean – and look particularly striking when balanced with bright whites. If you prefer, use darker and lighter shades of your chosen colour on different walls to create depth and interest. Click here for Paint. Statement wallpaper can be an eye-catching way to transport your bathroom to hotter climes too. Palm leaf prints in cool tones can create an exquisite focal point for your space and are a great way to bring in a fresh and on-trend feel to your sea-themed bathroom. Tiles, while practical, can also transform your space to create a real sense of beauty. To make a high impact statement, run tiles across the floor and up onto the walls. Alternatively, invoke an authentic feel by alternating patterned tiles and plain tiles to give a gloriously hop-scotch effect, reminiscent of Mediterranean village squares. If you’re looking for something a little different, try choosing scalloped-edge tiles. These unique tiles look exquisite and give a real sense of the sea. Whichever ocean-hued shades you choose, the key to the Mediterranean aesthetic is fresh tones, clean lines and refreshing design. Once you’ve chosen your colour palette, it’s time to decide on furnishings. The focal point of any bathroom, your bathroom suite has a significant impact on the overall look and feel of your sea-themed space. When thinking through your summer bathroom ideas, imagine immersing yourself in a shimmering plunge pool. The key is to recreate this sense of refreshing calm when choosing your bathroom furnishings. To do just that, a statement bath is the perfect choice. By placing your bath at the front and centre of your overall design, water becomes central to your coastal bathroom aesthetic. If you have the space, freestanding baths make a striking statement. Mirror the diamond-like sparkle of sunshine on the sea with a metallic-effect bath, like Heritage’s Hylton Freestanding Acrylic Double Ended Bath in gold, or give your space a clean and sleek look with our Penhallam Freestanding Acrylic Double Ended Slipper Bath. Alternatively, choose one of our exquisite cast iron baths and paint with cool tones to create a stunning feature. 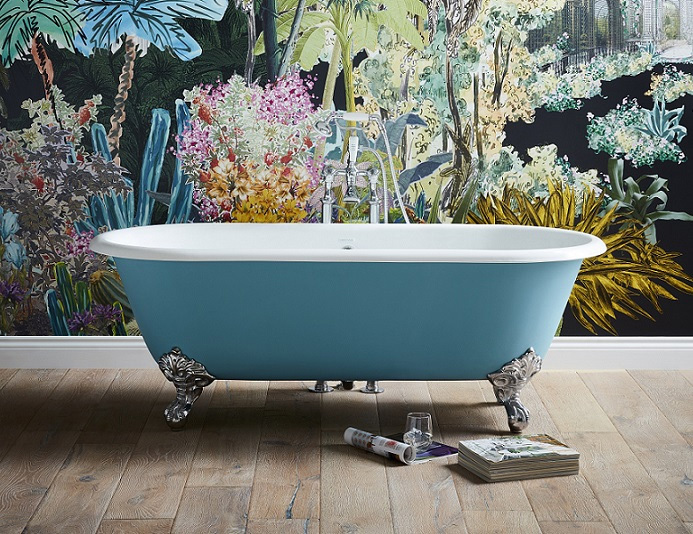 Creating beautiful sea-themed décor is more than possible with a fitted bath too. Choose a piece with clean and simple lines, like the stylish Blenheim Acrylic Double Ended Fitted Bath, and complement with a fitted bath panel that works well with the colour palette you choose. When it comes to basins and WCs, complement your suite with a design that works with your chosen bath. Heritage offer a range of bathroom furnishings that create cohesion, meaning that creating your perfect Mediterranean-themed bathroom is easier than you might think. For taps and showers, contemporary designs work well with sea-themed décor. Think about creating contrast with clean chrome lines, for example with the Gracechurch range of angular and endlessly stylish taps. The Gracechurch shower complements the contemporary design of these taps beautifully. The finishing touches are the perfect way to add extra flair to your sea-themed bathroom. Dress your space with accessories that add to the tranquility and restfulness of your design. Bring to mind the memory of sun-drenched landscapes with purposefully chosen indoor plants. Plants add a wonderful sense of nature to your space and help to create that feeling of calm. Cacti and succulent plants are a great choice when creating your Mediterranean bathroom and can look even more striking when potted in patterned or glass tumblers. When choosing your ocean bathroom décor, mirror the look of sunlight shimmering on water by choosing coloured glass tumblers, vases and ornaments. Think about placing your coloured glass on windowsills when dressing your bathroom. Here, they’ll catch the light beautifully and create stunning reflections across your room. The Mediterranean aesthetic is all about bringing the beauty of hotter climes into your home. To help you create a fresh-yet-natural look in your bathroom, consider adding hints of natural ornamentation to your space. Different textures, like interesting pebbles or shells, can help to add depth and ocean inspiration to your bathroom.